Tash is a Buddhist in Tibet, which is dangerous as Tibet is occupied by the Chinese and they have forbidden worshiping as Buddhists. Tash and her family practice their faith in secret and outwardly behave in such a way that the Chinese soldiers won’t give them a second glance. But Tash is aware of the strife as she watches a man set himself on fire in protest to the Chinese rule. Tash’s father runs the local newspaper and when he doesn’t report on the man who set himself on fire, she asks questions about why it wasn’t newsworthy and she learns that her father publishes what the Chinese tell him to publish. Soon after this, Chinese soldiers storm the house and while Tash hides, her parents are both taken in to custody. Tash narrowly escapes, with a note from her father which she intends to deliver to the Dalai Lama. Tash and her friend Sam brave the elements and the soldiers looking for the duo as they cross the mountains trying to get into India and to the Dalai Lama. I wish books like this had been more accessible when I was a young reader. Author Jess Butterworth delivers a political adventure story that engages, educates, and entertains. Every moment of the Tibetan life under the Chinese rule is totally believable and shows our young readers what an occupied country might feel like to the youngster. 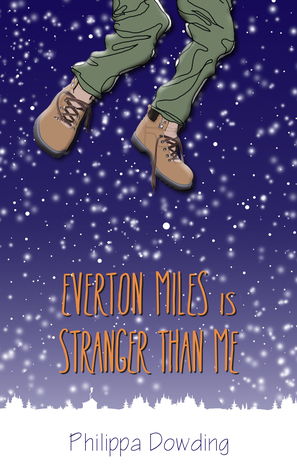 Tash is a little bit larger than life as she pushes against unbelievable odds, but that is precisely what you want in such an adventure story – a young protagonist pushing her/himself to the limit and a little beyond, to show that it sometimes takes an awful lot to really get what you are working for. To escape the soldiers with guns repeatedly also requires a little bit of luck, which Tash definitely possesses. While mostly an adventure story of survival and the fight for freedom of an entire country, there is also some mystery here as Tash attempts to learn who her father really is and what the cryptic message she is delivering really means. Looking for a good book? 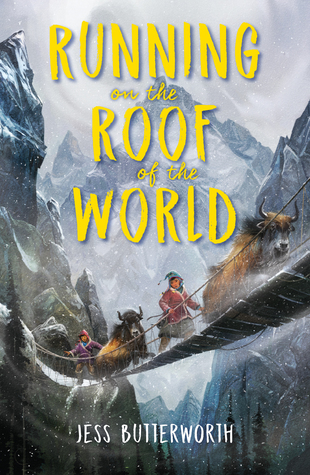 Running on the Roof of the World by Jess Butterworth is an all-around well-told story that really should capture a young reader’s interest and that reader will likely learn a thing or two along the way. I’ll admit right from the start that I was really disappointed when the rights to J.M. Barrie’s Peter Pan finally expired and suddenly there were a lot (in my opinion) of books set in the Pan universe. There are some stories that lend themselves to further adventures with additional characters and there are other stories that should probably just remain ‘sacred’ and left alone. So why did I request and read this book? The Disney company certainly has a stake in maintaining the Pan series and ‘doing it right’ since their animated film remains pretty iconic, so if I was going to read any new Pan story, going through Disney publishing seemed the safest route. In The Pirate Code (which is the second book in the Hook’s Revenge series by Heidi Schulz), the story revolves around Jocelyn Hook, the daughter of the (in)famous Captain Hook who squared off against Peter Pan. She has taken after her father and commands her own the crew pirates (including Smee and Starkey). She decides to search for her father’s fortune, which should be pretty easy since he left her a map, but Jocelyn discovers that being a pirate commander is challenging work (which includes fighting off other pirates), and that just because she has a map doesn’t mean understanding and following it will be easy. I liked that this story wasn’t about Peter Pan or Wendy or any of the ‘obvious’ heroes from Barrie’s story, but that we could still recognize Neverland through some of the locations, situations, and supporting characters. This definitely made the read more enjoyable for me. It is, of course, a little bit brilliant to feature a young girl in a strong role. The Peter Pan tale will bring in a number of readers, likely many of them young boys, but the strong girl will hopefully bring new readers into Neverland. And I also liked the character of Jocelyn. Strong, driven, but young and flawed. She’s nothing like her buffoonish father, and she’s a lot like him at the same time. What I didn’t care for was that this was set in Neverland at all. Really, there’s nothing here that couldn’t have been set in its own unique world. But we’re clearly trying to draw on the Peter Pan/Neverland names. I’m also not a fan of romanticizing villains in children’s literature. Pirates are not cute and clumsy characters and we do a disservice to paint them as such. 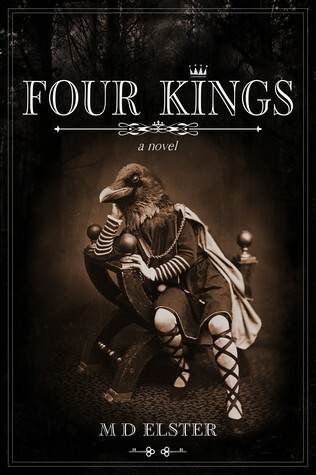 While I enjoyed the character of Jocelyn (despite being a pirate), I felt the book lacked a tight focus. The narrative asides really took me out of the story rather than making things clearer. All things considered, this was a pretty average read. Hard to recommend but just as hard to dissuade anyone from reading it. Looking for a good book? 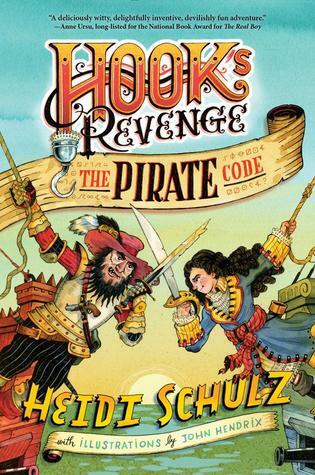 Hook’s Revenge: The Pirate Code by Heidi Schulz is a book set in Neverland but featuring the daughter of Captain Hook, now commanding her own pirate crew. The development of a strong female in a known setting makes this exciting, but the telling of the story doesn’t always live up to that excitement. Other than reading a few graphic novels for my book review blog, I am not connected to the comic book/graphic novel community. I don’t read up on what authors and artists are working on and I definitely don’t hear any advance praise or advance criticism. What that means is that when I request an Advance Reading Copy of a graphic novel, I know nothing about it, but usually the art or the description of the story catches my interest. As I delved into Elsewhere, a graphic novel written by Jay Faerber and drawn by Sumeyye Kesgin, I smiled. A genuine, “I’m really enjoying this” smile. We open with two individuals making a daring escape from a medieval-looking castle belonging to Lord Kragan. It takes a moment, but when we actually see these individuals – who happen to be chained together – we see that this isn’t Earth. Though humanoid, the escaping creatures have a more animalistic appearance to them. Not quite a primate like a gorilla, but something definitely foreign. And those chasing the escapees are different still and look to be more of the ‘orc’ family of creatures. Yet despite the brutish appearance of the escapees and the fleeing and the chase, the dialog between the two escapees borders on goofy and we don’t take any of this too seriously. And despite the imminent threat of capture or death, the two ‘men’ stop when they hear feminine cries for help. What they find is quite unexpected – Amelia Earhart is stuck by her parachute in a tree. Human and alien seem startled by one another’s appearance but get over it quickly and Amelia is focused only on finding her navigator, Fred Noonan, who parachuted just before she did. She does meet up with another human, but it’s D.B. Cooper, and we quickly get the picture that people who have leaped out of planes have been transported somehow to this strange place. Despite her sudden shock at arriving in a strange world, and learning that time as well as place flow differently, Amelia keeps a cool head and takes charge and leads a rebellion against Lord Kragan, which works quite well, thanks to their finding a German submarine, well-stocked with firearms! This has a real pulp feel to it. Think Edgar Rice Burroughs, Robert E. Howard, H. Rider Haggard. It’s campy fantasy with an adventure, sci-fi twist. And it’s fun. It’s made lovable by the stylistic art, which is bold and clean, by Kesgin, well colored by Ron Riley. You can’t take this too seriously, but for a fun diversion, especially for those of us who still love the Burroughs/Howard/Haggard stories, it hits just the right spot. This book collects the first four issues of the comic and I look forward to the next collection. Looking for a good book? 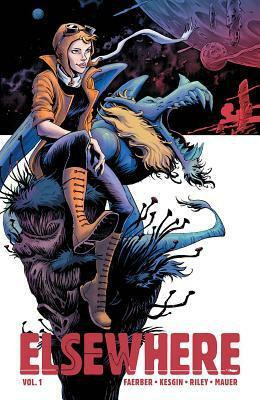 Elsewhere is a graphic novel by Jay Faerber and Sumeyye Kesgin that captures the spirit of the old adventure fantasy pulps, with some stylish new art and is a fun read. I definitely give publisher Angry Robot credit for pushing boundaries and going out on a limb and publishing works that don’t always fit nicely into the perceptions of sci-fi. But lately their catalog is starting to look a lot alike, with rogue, tough characters who are misfits taking on big business or politicians or an entire world. This particular take features “Hob” – a tough, female biker on a distant planet – somewhere in the middle of nowhere. While space travel clearly had been achieved by human-kind, this planet produces a dust/ash that prohibits much electronic communication, and so there’s a very isolated feel to the communities here. And with that isolation comes the opportunistic sort. Hob rides with a gang of outlaws (essentially) who provide ‘protection’ for the “Company.” But one day, the brother of the gang’s leader is found murdered and there needs to be some revenge! Adding to the unrest is a sense of “witchiness.” Hob may be a bit ‘Witchy’ herself, but no one likes to talk about it so it’s hard for Hob (and the reader) to learn more about what it means. The writing itself was just fine – nothing outstanding or particularly memorable – but I constantly had the feeling that I’d read all this before. Nothing seemed very original. Maybe a mash-up of a lot of different popular tropes. But still, it felt like a rehash. I looked through the list of Angry Robot books I’ve read and this reminds me a lot of their own Windswept series by Adam Rakunas but from a slightly different perspective. The world-building here didn’t work. Why does it have to be some distant planet? That happens to resemble the Old West of the United States with some technological advances? 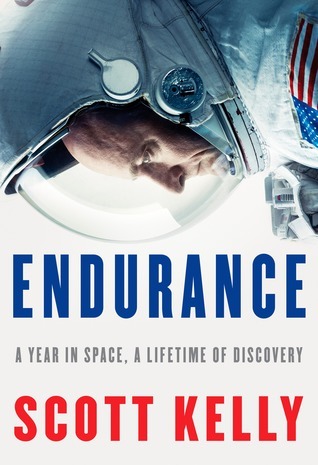 Alternating points of view in alternating chapters makes it a bit rough to read and it slowed me down unnecessarily, which made the whole book move slowly for me. I was really hoping for something original and engrossing, but that’s not quite what I got. Looking for a good book? 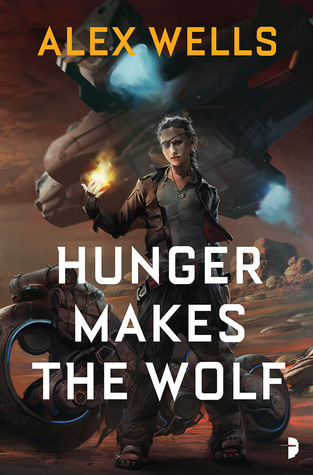 Hunger Makes the Wolf by Alex Wells is recognizable sci-fi – so recognizable that you won’t quite realize you are reading a new book.